Ahh, summer. That enviable time of the school year when teaches haul out their chaise lounges and brain candy books to loll about and wonder how in the world they'll fill all those hours until school starts again. Yea. Right. For those of you who are teachers or know teachers, you know how misguided and offensive that particular teacher trope is. As school years are winding down, preparation is underway and has been underway for summer school. 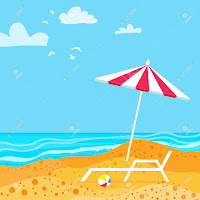 Administrators have been planning for summer professional development and/or summer work that needs to be done to review and revise whatever didn't work as well as hoped during the past school year. Classroom teachers are revising lesson plans or starting anew if they're changing to a new grade level. Educators are also starting to explore resources they've been setting aside for when they have time, even as more resources are recommended to them. In other words, there is no chaise lounge, no brain candy books, and most certainly no umbrella drinks. Or not many of them. Not sure how to get started preparing for next year? Check out what Matt Miller has to say. He's got 12 great ways for you to grow this summer. Twelve things is overwhelming to me, so focus on the first three. You can modify the PD Bingo Board to suit what makes the most sense to you and your colleagues. If the first three don't do it for you, find three that do. But only three. You can revisit an "oldie but goodie" from Vicki Davis who always has great ideas for teacher growth and development. Because Vicki is a wealth of ideas, you should follow her blog and follow her on Twitter. Just do that. Right now. I have a list of others you should follow, at least in my opinion, and I'm happy to share that with you. Most educators love to learn and often think that summer will be their time to "catch up." Which can be possible if there are no kiddos to get to travel sports teams practices and games, or to camp, or to wherever it is that the kids need to be. In fact, their expectations of teacher-as-parent availability skyrockets during the summer. Too often teachers get to mid-July and wonder what happened to summer and their plans. So review Vicki's list and Matt's list. Then pick no more than three. If you find you have more time, wonderful. Add another something to your list but if you pick only three and can really explore those three, you'll be in great shape for the school year. I've created another Personal PD Bingo board you can find here. The second page includes some notes for how you might accomplish some of the items on the board if you're not sure where to start. I'll continue to add to that but don't hesitate to reach out if you've got questions about any of the options or possibilities. The bottom line is this: learning doesn't stop for learners. Educators want to be better and do better every year but are often overwhelmed by the choices. Find three things that will help you accomplish your personal professional goals for the upcoming school year. Focus on those three things and grow, grow, grow!